It's the annual springtime ritual focusing on the biggest event in American racing — as the Kentucky Derby makes its way down the track on Saturday, May 4, 2019. This "greatest two minutes in sports" will air in a live telecast nationwide on NBC on Saturday, May 4, 2019 beginning at 5PM with race post time set at 6:25PM ET (5:25PM Central; 4:25PM Mountain; and 3:25PM Pacific). With the Kentucky Derby always scheduled on the first Saturday of May the 2019 Kentucky Derby post positions and morning line odds will be announced shortly several days before the big race. Traditionally announced on Wednesday, last year the post positions were set a day earlier. So keep it here for more updates on when the 2019 Kentucky Derby post positions will be officially drawn. With the race still weeks away, the 2019 Kentucky Derby lineup is already starting to take shape. Look for names like Tacitus, Omaha Beach, Plus Que Parfait, By My Standards, Maximum Security, Roadster, Game Winner, and Code of Honor to lead the pack of this year's top contenders. The first jewel in the Triple Crown, the Kentucky Derby offers the largest purse of all three races - $2,000,000 - luring the year's best 3 year-olds to the starting gate. Days before the race, horse racing fans check out the lineup to find out how they've run in the Stakes races of the season, along with graded earnings, and how the handicappers put it all together to come up with the odds on the leading contenders. on Saturday May 4, 2019. Heart-pounding anticipation follows. Who will scratch at the last minute? Who will have the heart to lead the field at the finish? The field is usually set by April. That's when winning horses (and well-placed finishers) have already proven themselves in the lead up to Kentucky. Qualifying races include the Florida Derby, Louisiana Derby, UAE Derby, Wood Memorial, Santa Anita Derby, Blue Grass, and Arkansas Derby. Each of these amass points that earns a spot in the Kentucky Derby field. With rain in the forecast all day, it was the wettest Kentucky Derby Day on record, breaking the old mark of 2.31” in 1918. Yet there was no dampening of enthusiastic support for this year's favorite, Justify, who came tearing down a sloppy track amid a steady rain to handily won the 2018 Kentucky Derby. And, in case we haven't mentioned it, Justify just happened to go on to win the Preakness and Belmont Statkes -- becoming the first Triple Crown winner since American Pharoah in 2015, and the first undefeated Triple Crown winner (with a 6-0 record) since Seattle Slew in 1977. Elsewhere around the Web, enjoy the stories of past winners, history and trivia that make the Kentucky Derby much more than just another horse race. Mint Juleps and the Hat Parade are just some of the fun surrounding this race at Churchill Downs on the first Saturday in May. Kentucky Derby - As race draws near there's all the news that's fit to sprint - with feature articles, daily blog, pictures and video clips, odds and latest lineup, breaking announcements. 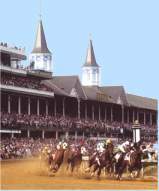 Churchill Downs - The official site of the traditional Derby track featuring news, story articles, betting info, event calendar, visitor information, track history. NBC Sports - Horse Racing - The official U.S. television station with plenty of coverage in feature stories, analysis, predictions, interviews, photo slide shows & video. Kentucky Derby Museum - Your old Kentucky home meets hi-tech with multimedia presentations on current exhibits. With schedules, hours, contact information, visitor guide, membership info and more. Flash and QuickTime required. Derby Post - The latest news and archives of past races, tip sheets, Horse Betting 101, messageboards and related links. Kentucky Derby Festival Official Site - A comprehensive schedule of events searchable by name, date or location, here at the official online fest celebrating Louisville's excuse for doing nothing but just horsing around all week. Kentucky Derby Day Recipes - If you can't make it to the race, sit back and party with do-it-yourself mint juleps, bourbon balls, Kentucky hot browns and a chocolately horse race pie with some fresh whipped cream. Tool around the rest of this Derby fan site for more history and color commentary on the big day. Derby Party Ideas - Recipes for Kentucky burgoo, derby pie, cucumber sandwiches, mint juleps, bourbon slush plus lots of creative ideas for party themes, decorations and setting up your own betting parlor.